I meant to welcome you to a brand new week yesterday, but Sir Comstanzes kept that from happening. You know him, right? He can be so captivating! Today is Election Day in America and we are all thrilled that it is finally here! No matter which candidate people supported in this election, we are ready to get back to being a CIVILized society. Yippie!! I received this beautiful metal leaf (and others) from my friend Milka and I think it works so well beribboned in plaid and gold on a warm fall card of thanks. The sediment is from Your Next Stamp. The tag is from Poppystamp's "Stitched Main Street" tags, heat-embossed in blue moire powder. AAA Cards: Thanks / Thanksgiving. Cuttlebug Mania: Tic Tac Toe: embossing, die cuts, purple. 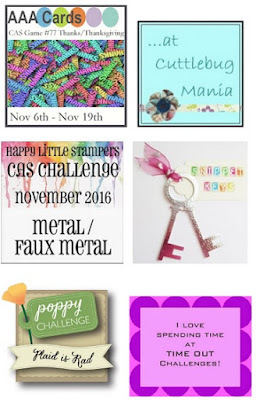 Happy Little Stampers CAS Challenge: Metal / Faux Metal. Poppystamps Challenge: Plaid is Rad. TIME OUT Challenge: "Give Thanks With a Grateful Heart." The only rule for my Thanksgiving Crusade is that you make and send cards of thanks. You may thank the people closest to you, or you may choose to thank people whom you haven't seen in years or you may thank someone who doesn't know you at all. Doesn't matter. Let's just take this as a perfect opportunity to thank someone. Please consider joining us for the Thanksgiving Crusade even if you're not Canadian or American ~ thanksgiving knows no national boundaries. Show gratitude. Give thanks. Save Thanksgiving. My card is for our neighbor who unexpectedly changed our dinner plans for the better by offering us one of the large trout he had just caught that afternoon! It was delicious! And thank you for your crusade, Susan! Wow! I think I would be very exhausted!! Beautiful card, and gorgeous photos of your outing. I'm sure you will be relieved when the election is over, but I rather fear that whatever the outcome, you'll all be left feeling as dazed and bewildered as we over here have been since the Brexit vote. Months later we're all still shuffling around and thinking, "Well.... NOW what?" - whichever way we voted! Beautiful collage... stunning card , love the beribboning! And yes, the whole world is glad election day is here for the US ;) enough is enough! Hooray for election day. A wonderful card Darnell and wonderful photos of your grandsons. Hi Darnell, Loving your card. That metal leaf is fab. Lovely collage of your grandsons and grandpups. Sir Comstanzes is visiting me too! And that card is so warm; will being some sunshine in the house of the reciever! Beautiful Fall card! I am sure your 'trout' neighbor will admire it! (I said admire because he is a man..lol)...Great pics of the grandkids and granddogs, too! My Thanksgiving is always home, never, ever shopping, it is such a family day toe us! You should enter your card at Double D, it is perfect for it! What a lovely card, Darnell! That leaf is gorgeous. Well done! Thanks for sharing some of the pics of your grand adventures with your grandsons and granddogs. It sure looks as if a great grand time was had by all. :) Hugs! Lovely card, Darnel - congratulations! I love your card, the plaid ribbon is fab! Yes I am heartily sick of all the political adds etc. Living near DC we rarely have a year in which there is no election either in VA, MD, or DE. It's constant, and I will be so glad when it is over. YOur collage is wonderful, I bet it was great weekend. Beautiful card Darnell, and the collage of your time with the boys is so fun. TFS. Yup - the metal leaf and plaid ribbon are brilliant together and that embossing paste is super cool. All your photos are gorgeous (with those 4 handsome boys how could they not be?) but that large photo of the tree is especially stunning! Adorable card, you have made a great use of Milks's gorgous gift!! And your lovely picture collage has made me smile, this pair of twins look adorable :D Beautiful both the twins: boys and dogs! Brilliant card, great colours and love the metal leaf. Hope the result of the election is to your liking. Wonderful use of metal leaf on the card. :-) Great CAS. Thank you for sharing photos. Superb collage. Wonderful card, Darnell! Love the plaid ribbon with the beautiful leaf. I also enjoyed looking at your collage of pictures. The boys are growing up! I love your beautiful Autumn card you created with that metal leaf and awesome colors. And, like you, I am glad it is election day and that we can go back to a more normal life hopefully with us all being united too. Thanks for sharing your wonderful photos too. Beautiful leaf, Darnell, and I like the way you incorporated it into a card. I like trout too, and the pictures of the boys, two legged and four. Such a pretty card Darnell! Love that leaf and the little plaid bow! I love Thanksgiving! It's one of my very favorite holidays! Loved seeing your collage of photos! Looks like you had a wonderful time with the family! Too funny about the testosterone!! I know the feeling! haha! Love that leaf and the plaid ribbon! Somehow plaid seems perfect for fall! The boys sure are growing! That pretty plaid ribbon won me over, fabulous card Darnell!! CUTE photos of the boys and pups. So happy you got to spend time with them!! That metal ,eat is just stunning with the plaid ribbon. So glad you had a great time with your grandchildren! What a lovely metal leaf from your friend, and you dressed it up so wonderfully. A great card with a great sentiment behind it. 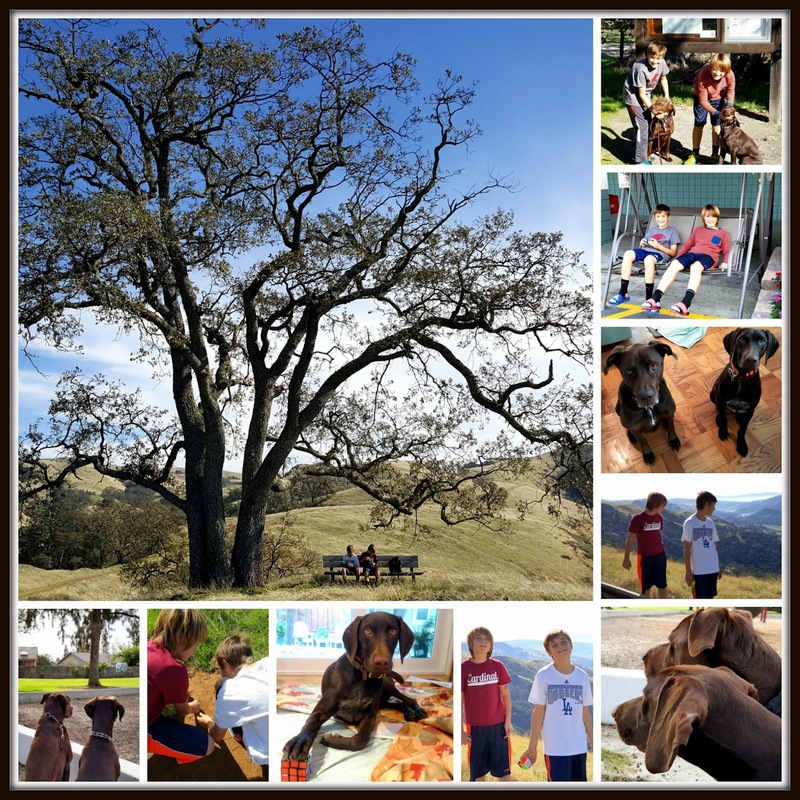 LOVE the collage, Darnell--looks like you had a great time with the kiddos & puppy dogs! What a beautiful metal leaf & love the ribbon you used! 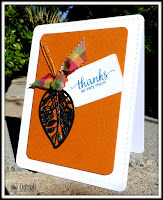 Gorgeous card Darnell ..... love the metal leaf, and the plaid looks so pretty. Very gorgeous card Darnell ! 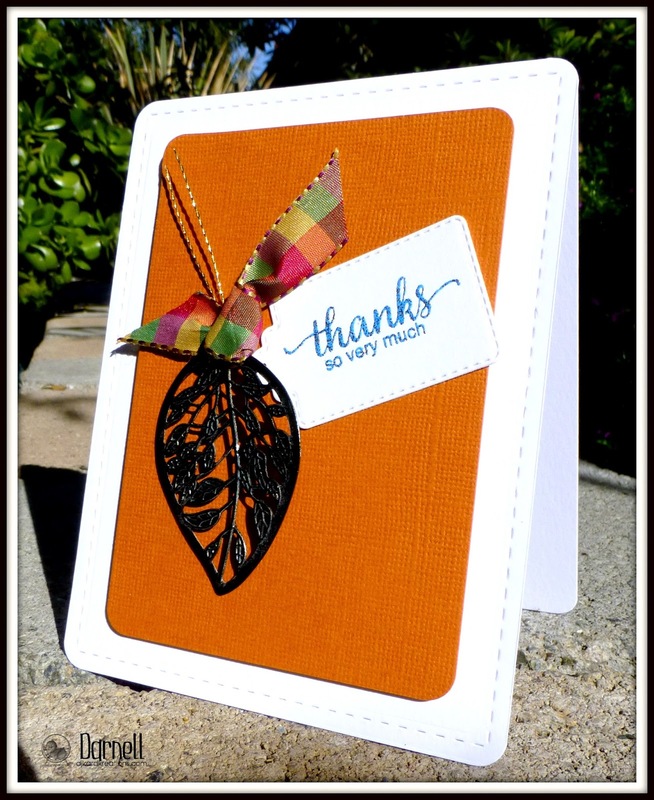 I love how the black metal leaf is popped up by the orange card stock background ! Yes, here too we know very well Sir Comstanzes !! Love your collage and OMG what a beautiful tree and view ! I think that I would spend a lot of time sitting here on that bench ! I can see through this collage that your keyword is also Carpe Diem! That's great ! Enjoy every little moment ! Hugs. The beribboning is a wonderful touch Darnell, I love your cheery card, the stitched border on the card and tag look so lovely! What a terrific card Darnell... The leaf is so pretty! Great photos of your Grandies... not sure what is cuter, the boys or the dogs and I too sympathise with your DIL Lol! Well, the election is over ... It has dominated our news in the UK for months. Mike and I were up in the early hours to see the results as it happened ... You have a great day!! Gorgeous card, Darnell. I'm so thankful to have met you this year. What a stunning card and such a lovely gift from your friend. The ribbon is so gorgeous and fallish. I love the pictures of the twins and I am truly impressed with the rubics cube the dog worked out. Yep, the election is over and I am so over it. The rest remains to be seen. Hrumph! Going back to being CIVILized. Speak for yourself, Missy. I plan to be uncivilized and bohemian as long as possible. Cool card. I thought that leaf looked quite metallica and wondered the secret. The secret of course, is to use metal! ha! Wait, blue moire embossing powder?! I've never seen that! How FUN!! And I'll express some gratitude to you for sharing your photo collage with us, Darnell. Always a treat to see how big the twins are getting! Love this CAS card! Great colors and a fabulous metal leaf! Love the photos too - my goodness those boys have grown!! Such a great fall card. The colours and design are perfect. Thanks for playing along with us at AAA Cards! WOW!!! Gorgeous card, gorgeous pictures!!! 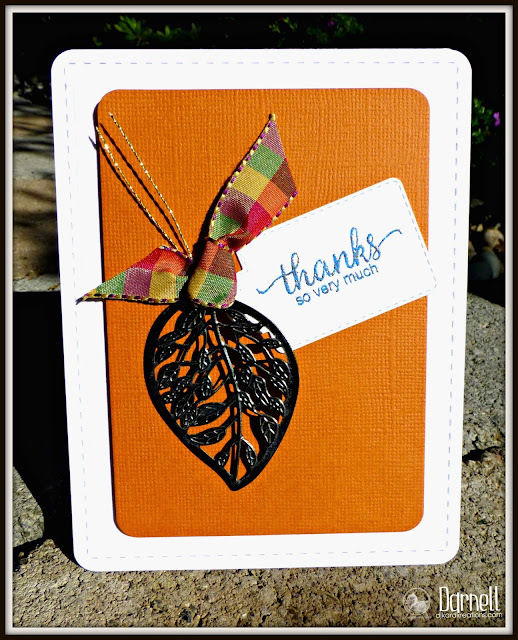 I love the plaid ribbon and how great the leaf looks with textured cardstock! The pics are fabulous! The twinks are sooooooo dang cute! And, my goodness, they are growing so tall! Totally lovin' the sweet puppers too! Yep - testosterone definitely trumped estrogen with this gaggle of males! Beautiful card of thanks Darnell. Lovely card Darnell! The metal leaf & plaid ribbon is beautifully complimented with that gorgeous blue embossed sentiment. Loved your picture collage! Wonderful card Darnell, love that metal leaf perfect for the card. And the tag with the embossed sentiment finishes it off perfectly. Brilliant photos, boys and dogs. Love the warmth of the card and the metal leaf is divine. Gosh, the boys seem to be growing at a rate of knots and a dog with a Rubik's Cube? Wow, and without opposable thumbs too lol! Thanks for your kind comment matey. Hi Darnell, how beautiful you used metal leaf. I love the contrast of leaf on an orange background and perfectly matching ribbon. I want to say your leaf card is gorgeous (which apparently I just did! ), but since it was destined for your neighbout, I'll go with manly terms: handsome, striking and masculine marvelous! Perfect 'thanks' for the gift of dinner! Your collage of all your boys: awesome! Looks like everyone - two-legged and four - had a fantastic time!